Hi, welcome to my website. I am Dr Andelka M Phillips and this is my personal website. I am a writer and an academic interested in Information Technology Law and Health and Medical Law. I have created this page primarily to make more of my work accessible. 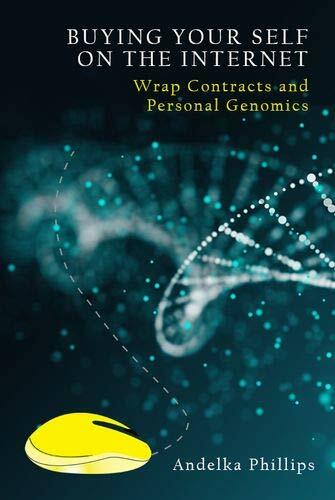 Much of my recent work has been concerned with the regulation of direct-to-consumer genetic tests, examining the industry’s use of wrap contracts (browsewrap and clickwrap) and I am also very interested in the uses and storage of genetic and genomic data, as well as genetic privacy. I am currently working on a book, entitled Buying Your Self on the Internet: Wrap Contracts and Personal Genomics to be published by Edinburgh University Press as part of its Future Law series in 2019. The book is available for preorder on Book Depository and Amazon UK. I am also co-editing with Professor Jonathan Herring and Professor Thana C de Campos Philosophical Foundations of Medical Law, which will be published as part of Oxford University Press’ Philosophical Foundations of Law series also in 2019. I am interested in a wide range of topics including: electronic contracts (wrap contracts), consumer protection, artificial intelligence and regulation of robotics, emerging technologies in healthcare (including wearables and implants), surveillance technologies, synthetic biology, cyber security, privacy and data protection, responsible innovation, and the regulation of emerging and disruptive technologies, especially developments in the Internet of Things and smart computing systems. I am also particularly interested in governance of future spaces and the societal impact of new, emerging, and disruptive technologies. I am a Senior Lecturer at Te Piringa, Faculty of Law, the University of Waikato and a Research Associate at the University of Oxford’s Centre for Health, Law and Emerging Technologies (HeLEX). I was previously the Ussher Assistant Professor in Information Technology Law at Trinity College Dublin and the Convenor of Trinity College Dublin Law School’s Technology, Law and Society Research Group. I have also taught at the University of Oxford and the University of Auckland. 23rd February 2018 Update – I have released Version 1.3 of a data file on direct-to-consumer genetic testing companies – please see the DTCGT Research page. I completed my doctoral degree at the University of Oxford and my LLM(1st Class Honours) at the University of Auckland. While at Oxford, I convened the Oxford Medical Law and Ethics Discussion Group and the Oxford Privacy Information Law and Society Discussion Group. I was also the General Editor of the Oxford University Commonwealth Law Journal. See here for the latest issue of the journal.